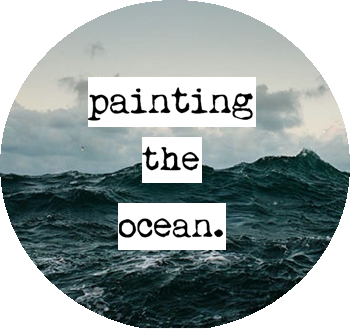 Painting The Ocean: there's a world out there. there's a world out there. There's a world out there, she said. There were crinkles in her eyes as she did: like indentations on a map scorned over years of travel; thumb prints that marred the surface in gentle caresses. She tapped on the window like it wasn't there. Like if she pushed hard enough she would fall. No, not fall. Infinity would catch her. Her eyes were the perfect echo of adventure. And when I searched for long enough, I could forget the shadows. They'd just melt away. 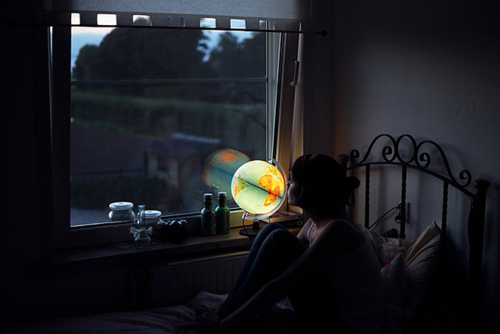 I keep a globe on the window sill. I change it every year because adventure isn't stationary. It doesn't just still, it evolves, it dances. The same way I know that she's still dancing. This world was too silent for her. She wasn't too loud. There's a world out there, I whisper and my words float in the wind. Hello, the sun is shining, the clouds are out and I'm actually writing a blog post. I wanted to take this little website back to its roots - writing. I formed Painting The Ocean as a creative outlet; a place where I could write and project my thoughts in a simplistic yet aesthetic way. This blog has always been the source of anything I've ever done on the internet and, truthfully, I miss it. It feels neglected... like its lost some of the magic it brought me and (hopefully) you too! As you know, creative writing is my favourite hobby. I try to indulge in it as frequently as possible although recently it seems other things (Youtube, tumblr, Netflix etc) have taken its place. And that's not cool. So, hello, and enjoy this little something which dripped off my fingers quite literally two minutes ago. Like always, this is inspired by a picture I found on tumblr.